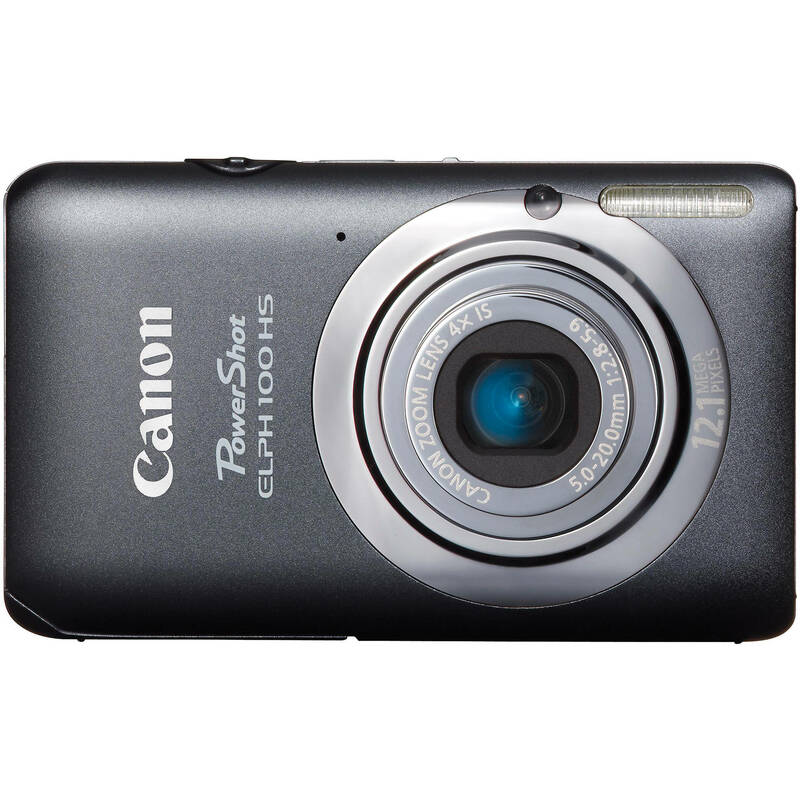 Canon's Powershot 100 HS Digital ELPH Camera (Gray) packs a whole galaxy of features into its compact (3.67 x 2.20 x 0.78"/9.3 x 5.5 x 1.9 cm) and lightweight (4.27 oz/121 g) body--a 12.1MP CMOS high resolution sensor, 4x wide-angle 28-112mm lens (equivalent in 35mm format), and full 1920 x 1080 HD video with stereo sound, for starters. It's also got the advanced HS system delivering clear, sharp photos with detail and nuance in low light, with high or low ISO images. Optical image stabilization keeps away the shaky pictures and video, and Smart AUTO recognizes and sets optimal exposure, shutter and focus settings for 32 predefined shooting situations. The Super Slow Motion Movie mode records video at 240fps for a very slow motion playback, and the High-Speed Burst mode allows you to shoot still photos at up to 8.2fps. A large range of creative effects is available, including fisheye effect, miniature effect (stills and video), toy camera effect that creates a vignette similar to pinhole cameras, monochrome, super vivid, color accent, color swap (pick one color in a photo and replace that color with another of your choice), long shutter to blur moving objects for artistic effect, and many more. This ELPH is ready to serve. The Canon HS SYSTEM takes the frustration out of low light shooting. The system delivers clear, blur-free shots with all the ambiance intact, and frees you from the sometimes unwanted effects of using the flash. Beautiful low light shots are possible at both low and high ISO speeds, and the dynamic range is expanded to retain maximum detail in highlight and shadow areas. The system is the result of two technologies brought together in a compact PowerShot. The first is the 12.1 Megapixel CMOS Sensor, which positions the light-receiving surface for optimal light reception. More light means clearer, blur-free images with plenty of detail and nuance, even in dark areas. Working together with the CMOS sensor to deliver the HS SYSTEM is Canon's advanced DIGIC 4 Image Processor, which actively reduces noise and delivers high speed image processing. 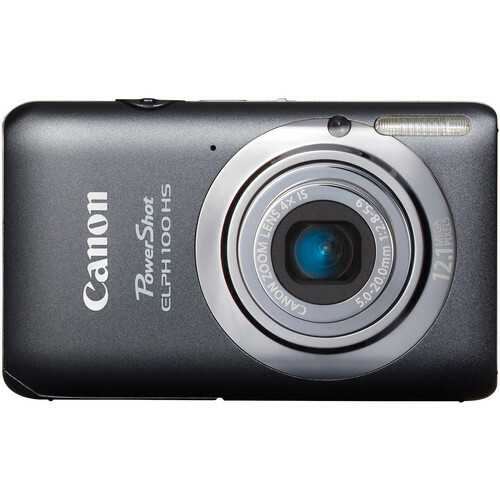 Experiencing the brilliance of Full 1080p HD video in a Canon PowerShot ELPH digital camera has never been easier. You'll be able to record everyday moments in amazing life-like realism at a push of a button and you won't have to worry about shaky footage because Dynamic IS will help keep your videos steady! Sometimes, the action just won't stop for you. The PowerShot ELPH 100 HS digital camera is equipped with High-speed Burst Mode that can capture 8.2 frames per second, letting you catch the sequence of the action-a feature great for using at sport events! You can also add a fun slow motion effect to you videos with Super Slow Motion Movie. Super Slow Motion Movie will record your clips at a high speed so that when you watch your videos, they'll play back in slow motion-a feature also useful for analyzing a play-by-play of sports moves! The PowerShot ELPH 100 HS digital camera takes the quality of your still images and videos to a whole new level - automatically. The camera's advanced Smart AUTO system detects a wealth of information about the scene you're shooting, then automatically selects the optimal settings for you. Now with an expanded range of 32 shooting scenarios, the camera handles a wide variety of situations, freeing you up to concentrate on composing your shot and capturing the moment you're looking for. From portraits to landscapes to action scenes, the PowerShot ELPH 100 HS digital camera has you covered whether you're shooting stills or videos. Access advanced exposure compensation features while shooting mostly automatically. Records a video clip before capturing a still image and then combines one day's worth of clips into a video. The camera sets a large aperture, focusing the subject and artistically blurring the background to make your subject "pop." Reduced focusing time freezes fast-moving subjects, so you won't miss those special shots. The camera shoots continuously at a high speed of approx. 8.2fps while you hold down the shutter. The camera takes five photos in succession, and then chooses the best one out of the bunch. Suppresses image blur even without the help of a tripod. For high quality image capture in an amazing range of dimly-lit situations. Add a classic photo distortion without a fisheye lens. Emphasizes perspective for a miniature effect by blurring upper and bottom portions of videos and stills. Choose to retain a single color in your image while other colors turn monochrome. Select a color and replace it with a color you specify for special effects. Get clear shots of people at a sunny beach without darkened faces. Capture brilliant shots of autumn foliage, greenery and blossoms. Grab brilliant images of skyrocketing fireworks. Build awe-inspiring panoramas by neatly aligning sequential images. Shoot in Full HD (1920 x 1080) at 24 fps for up to 14 min. 53 sec. or 4GB per clip. Shoot in HD (1280 x 720) at 24 fps for up to 21 min. and 23 sec. or 4GB per clip. Shoot in VGA (640 x 480) at 30 fps for up to 46 min. and 46 sec. or 4GB per clip and QVGA (320 x 240 at 30 fps) for up to 2 hours 23 min. and 41 sec. or 4GB per clip. Record your clips in high speed (approx. 240fps), and then watch your videos in slow motion. The PowerShot ELPH 100 HS digital camera has the tools you need to photograph every moment in crisp, clear Canon quality. From wide-angle to telephoto, the 28mm Wide-Angle 4x Optical Zoom Lens lets you capture more into every shot. The Optical Image Stabilizer will also help keep all your images steady. The big and bright 3" PureColor System LCD screen lets you see everything easily, so whether you're trying to frame a shot or just reviewing your images, Canon helps you get the best image every time. Putting together a video containing highlights from family vacations, important occasions and other special events is now easier than you might imagine. Using the Movie Digest Mode, you can have the camera automatically record a short video clip (up to approximately 4 seconds) every time you shoot a still image. The camera will then combine an entire day's worth of clips into a single video. No editing required - Movie Digest Mode does all the work, so you can sit back and enjoy your video! Shooting start time (0-10 sec. (in one-second increments), 20/25/30 sec.) and number of shots (1-10 shots (in one-shot increments)) can be specified. Box Dimensions (LxWxH) 6.2 x 5.6 x 2.3"
Powershot 100 HS Digital ELPH Camera (Gray) is rated 4.4 out of 5 by 203. Rated 5 out of 5 by Anonymous from Search ended here. I was looking for additional pocket size camera that I could use in places where I cannot carry my Canon 60D DSLR and my search ended here with Canon Powershot 100 HS Digital ELPH Camera. The things that I like in the camera beyond good picture and video for the price is its size. Its just the size of a credit card (H x W) and the high speed video. Its fun showing those slow motion videos to friends and family. I have been taking pictures with this camera and I am very satisfied with its performance. There is no doubt about its capabilities when there is enough light and it performs well in low light conditions also. I like it and would recommend this to others. Rated 5 out of 5 by Anonymous from Love It! I am a professional portrait photographer, but hauling around my expensive big equipment for personal use was wearing on me and my equipment! My husband needed a new camera for his work and asked me to find a reasonably priced point and shoot that could also double for taking pictures of our family outings. After reading and researching quite a bit, I decided on this camera. We have loved it so far and I love that I can go to family gatherings without having to take my expensive camera and wearing it out faster. We also love that it has a chargable battery and the performance for a point and shoot is great. Rated 4 out of 5 by Anonymous from Great buy at a great price! If you are looking for a camera that will not burn your pocket, but still takes great pictures to make everybody else jealous, you are doing the right thing by buying this one. I had a chance to use it for one of my recent trips and loved the abilities as well as the responsiveness.Additional features such as miniature effect, high burst pictures, etc are only adding on how great this little camera is. Battery life is way too good and it's very durable. I see some noise on the darker pictures with minimum light, but understandable with the mini flash it has. Great buy so far! Rated 2 out of 5 by pizzolog from Canon Powershot 100 HS Digital ELPH Came There is a lot about the Canon Powershot 100 HS that I love, but the bottom line is I had to return the camera. The reason for the return is the Canon100HS does Not take as Good or as Sharp a picture as the three year old point and shoot Nikon S600 which I had hoped it would replace. With all the Canon100HS's remarkable breakthrough technology . . ie . . 8.2 fps burst . . slow motion video . . HS System . . Auto Smart . . etc. . . the 100HS still has to take as good, or even better photographs as an old discontinued camera. I hope this feedback eventually gets back to Canon so they can make the necessary improvements to an otherwise truly notable camera. Rated 5 out of 5 by Anonymous from great lightweight camera Got this camera to share with my teen daughter who was going on a field trip to D.C. Perfect travel camera - very light, good quality output if you are aiming to capture shots of vacation. Shutter speed is fast, so there is no weird movement after taking the picture; impressed by small profile, but large LCD screen. HDMI video, myriad playful settings (ie fisheye), and mod color choices are bonuses that appealed to young teen and her friends. The camera helped create and capture a fun trip. Rated 5 out of 5 by Kristen from Great little camera! I have a DSLR and love it. My daughter (8 years old)wanted her own camera as well. We previously went the route of $30 cameras, and they were pieces of trash. This time around, I wanted her to have something that would take decent pictures and not break within the first few days. This one fit the bill! (We bought insurance to go with it.) She is having a blast clicking away and video-recording her brother! We haven't uploaded any to the computer yet, but the pictures look good from the back of the camera. She especially likes the great zoom on it. Rated 5 out of 5 by Sorority Girl from This Product is the BEST CAMERA I love this product because it is not only stylish and light weight but it is just a great product all around. As a college student, I love to take my camera everywhere with me and this camera is perfect for that. I have had 5 cameras (all of different brands) in the last three years and this one is my favorite so far. The pictures turn out great and it was very easy to use. It takes great pictures inside and outside and all of the features are so fun to play around with. For a person with a busy life, this camera is perfect to capture every moment.